The time has come for many music legends to part ways with the stage and retire their creation humbly by saying goodbye to the fans proper with a last and final tour. Having shared with the world their time, energy and pure talent for numerous decades, music artists by the likes of Black Sabbath, Slayer, Paul Simon, Elton John, and Lynyrd Skynyrd present the ability to witness a piece of physical history before it slips into the immortal auditory realms forever. 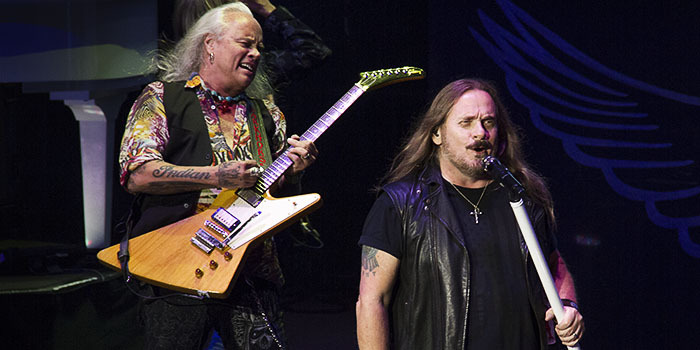 American classic rock masters Lynyrd Skynyrd graced the Shoreline Amphitheater with the Last of the Street Survivors Farewell Tour presented by SiriusXM to a comfortably large capacity of dedicated fans. The band has embarked on their two year farewell tour with various support acts to close our their career on proud and celebratory notes. 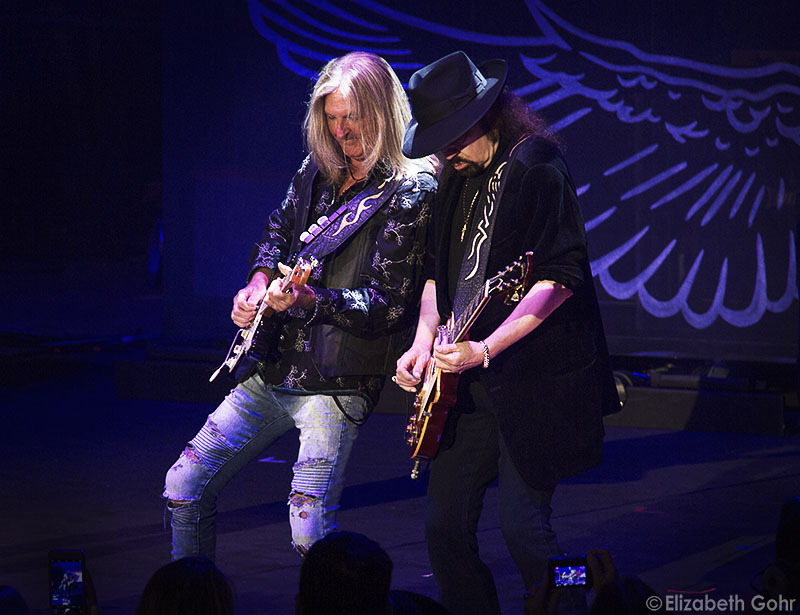 Originating from Jacksonville, Florida with their roots cut deep in Southern rock history, Lynyrd Skynyrd is a band known not only for their music, but also for the rough ride they endured. After great success in their music career, the band experienced a devastating tragedy in 1977 when a deadly plane crash claimed the lives of lead vocalist Ronnie Van Zant, guitarist Steve Gaines, his sister and backup singer Cassie Gaines, the assistant road manager and both pilots. The surviving members experienced severe injuries which lead to a decade long break only to have Lynyrd Skynyrd resurrected in 1987 under the direction of founding guitarist Allen Collins who was previously paralyzed in a car accident and died of complications in 1990. Sadly the band slowly lost other members throughout the years as new and old musicians were rotated in, with the last remaining original to carry the torch being guitarist Gary Rossington burning bright on his Gibson Les Paul. 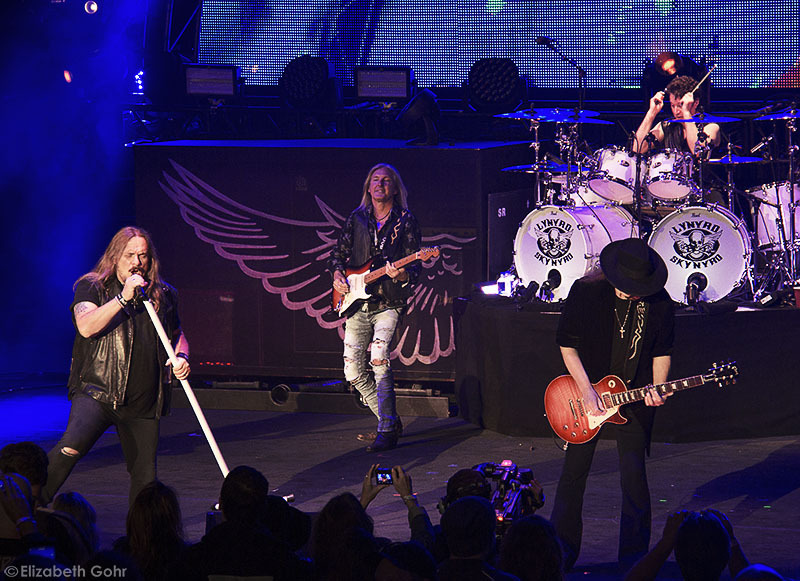 A signature Skynyrd sound lies in the overlapping tones of three guitars. An active member in the early incarnation of the band as a drummer and also a key player in the reformation is guitarist Rickey Medlocke, providing great energy on his Gibson Explorer, recollective of Collins’ choice axe. Then we have guitarist Mark Matejka accompanying the trio on his Fender Stratocaster and gliding along with Rossington’s rhythm. Sitting behind a classic set of white grand pianos that is reminiscent of the late keyboard player Billy Powell is replacement Peter Keys, a member since 2009 after Powell passed from a heart attack. On drums is Michael Cartellone, an active member since 1999 along with newcomer Keith Christopher on bass. 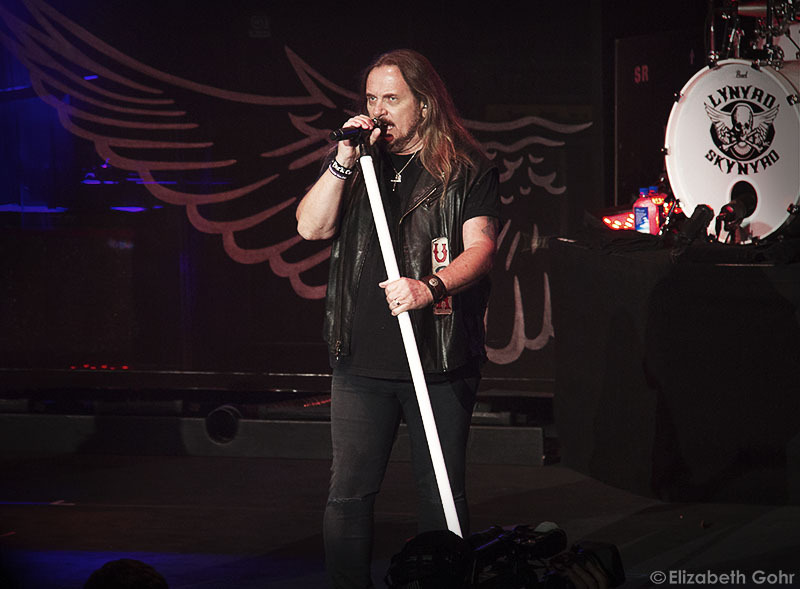 Providing backing vocals are songbirds Carol Chase and Dale Krantz Rossington with lead vocalist Johnny Van Zant guiding on his big brother’s legacy. Johnny gave kind words to the troops midway through the set and noted the generous donation of $1 from every ticket sale goes to The Shriners foundation. The set was booming with all the hits, a steady cruise through the classics by the likes of “What’s Your Name,” the iconic song “That Smell,” and “Gimme Three Steps,” to get all the boots stomping. Then there were the slowed down melodies of “Tuesdays Gone” and the song “Simple Man” that set the souls sailing as they swayed in the soundscape. 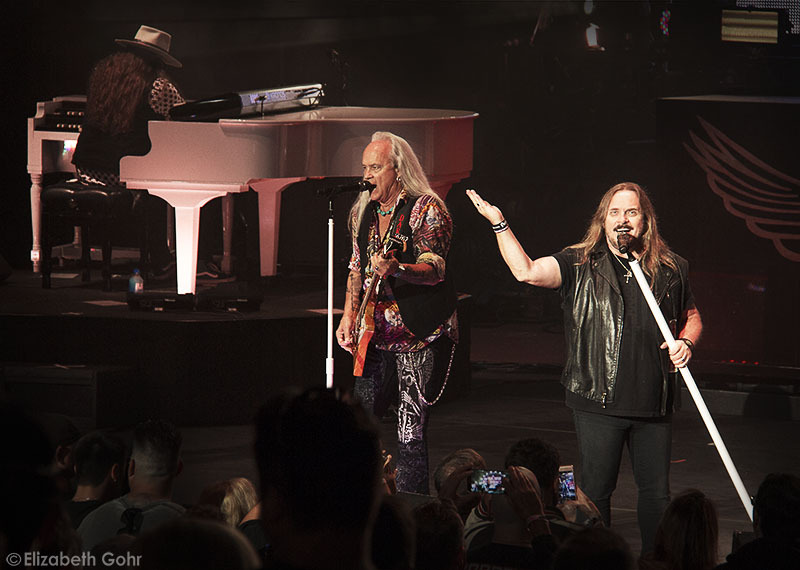 Lynyrd Skynyrd ended the set with their most signature classic rock hit, “Sweet Home Alabama,” that had the crowd gleaming and singing in joy, proving this music will forever remain timeless. The encore featured the all-time greatest hit “Free Bird,” starting out with a bittersweet ballad as the deceased band members names appeared on the screen in memorial. 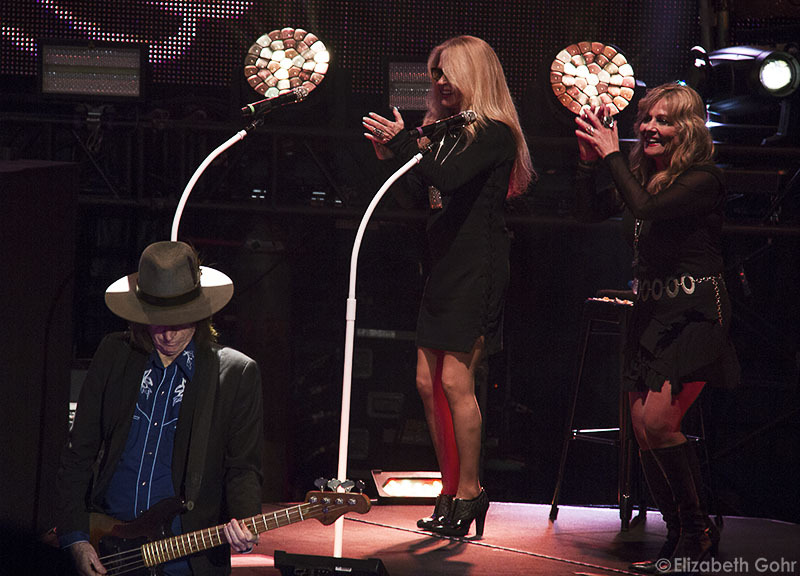 Then a live video appeared of Ronnie Van Zant singing along with the song and Johnny left the stage with Ronnie’s hat left on a microphone stand. 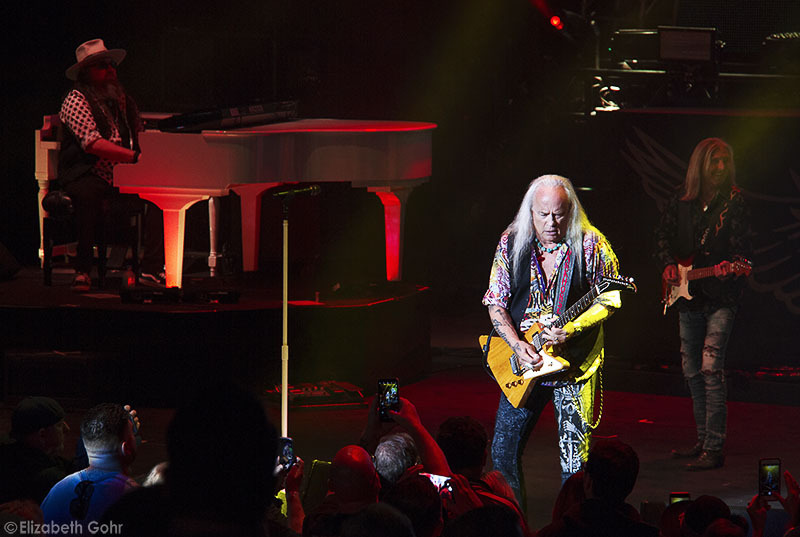 The band burst into a sonic firework finale of all three guitarists lighting off with Medlocke ripping away on the solo and Rossington riding along with the swift slide guitar. A giant disco ball was dropped in with all the lights spiraling around it and Lynyrd Skynyrd bid farewell the same way they greeted the world, with a gift that all ages from all generations can truly appreciate. 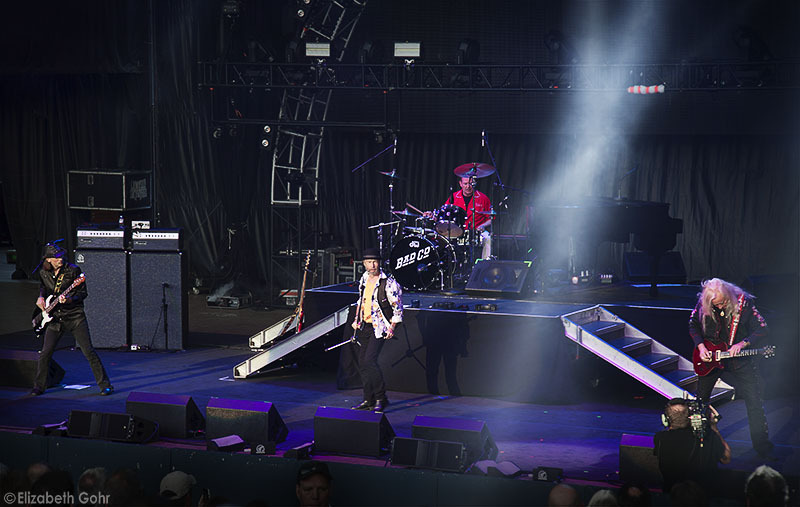 Fellow touring companions and classic rock heavyweights Bad Company opened up for Lynyrd Skynyrd and joined them for five West coast dates on the tour. This legendary supergroup from London had great success throughout the 70s and features founding members Paul Rodgers on lead vocals and keyboards along with long time bandmate Simon Kirke on drums. 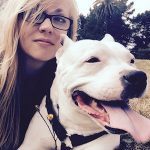 More recent additions to the lineup also include Howard Leese on guitar and Todd Ronning on bass. Bad Company jumped right into their hit song bank to generously warm up the crowd with the title track off of their debut self-titled album, “Can’t Get Enough,” the classic “Feel Like Makin’ Love,” a cover of “Born Under a Bad Sign” by Booker T & The MG’s, and ending with the encore hit song “Bad Company” featuring Rodgers on the piano. 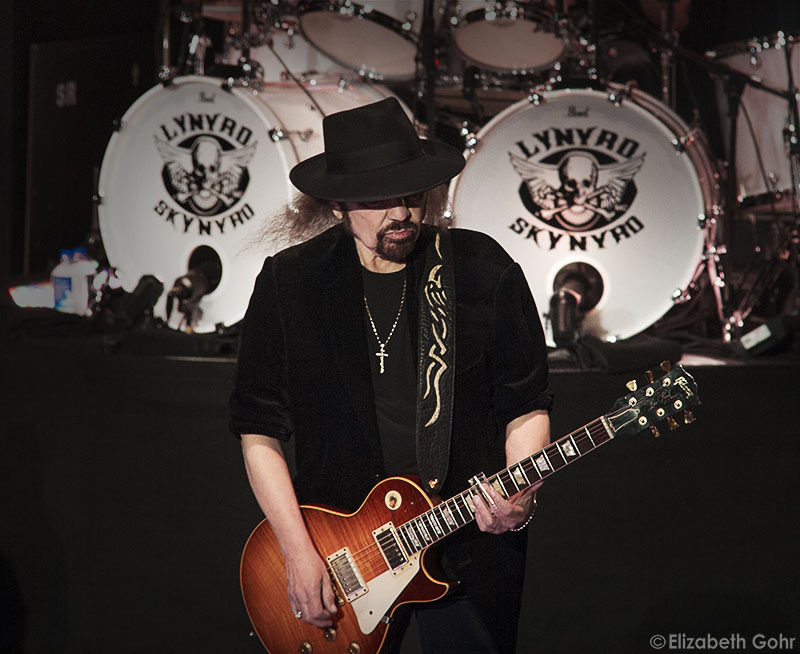 Find out more about Lynyrd Skynyrd here. Check out Bad Company on their website.